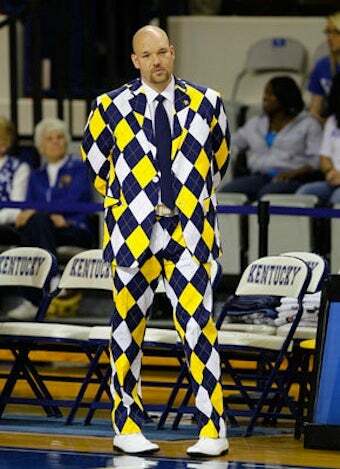 The coach of the Morehead State women's team wanted a way to grab attention to help recruiting. His solution? Well, you see the photo. Tom Hodges — at 28, the youngest D1 coach in the country — needed to set his Eagles apart. So he thought of one golfer who manages to stand out from the crowd, despite not having the greatest skill set: John Daly. That's right, Hodges turned to a life of blowing his money on booze and easy women. No, not really. But he did call up LoudMouth Golf, Daly's clothing sponsor. They sent over a handful of suits and "at least 15 pairs of pants that he calls the 'wildest, craziest things you ever have seen.'" Gratis, as long as he wears them to games. Not that we imagine he'd wear them in day-to-day life.